LG let it slip out last month that it was working on a high-end fashion phone with Prada but today has gone ahead and officially announced the PRADA Phone by LG. As expected it is a stylish device and actually looks a great deal like the upcoming Apple iPhone. Like the iPhone, there is no physical keyboard on the Prada phone. It instead relies on a touchscreen powered software keyboard. 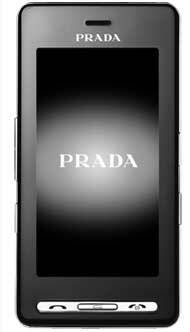 The Prada phone will be shipping in February in both mobile phone channels and Prada stores. The price starts at 600 euros unlocked.